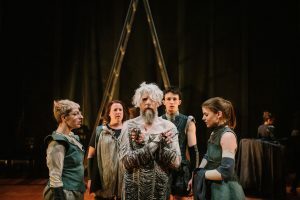 Hamlet Apocalypse theatre review (Theatre Works, Melbourne) | Daily Review: Film, stage and music reviews, interviews and more. The stakes are high in Hamlet Apocalypse: the end is nigh (Q.E.D.). Fortunately, there’s been enough of a heads-up for a group of seven actors to get together and ‘put on a shew’ to face the coming annihilation with a defiant production of Hamlet (Q.E.D., again). And for some reason, not immediately clear, we’ve chosen to spend our remaining 80 minutes watching them. Well, we had tickets. And there’s enough of a heads-up that they can count – down to the exact second – to the moment the catastrophic event will occur. Though not enough of a heads-up, evidently, to consider that Hamlet is much, much, much, much, much longer that they’ve allowed time for. Much. Maybe we should have started this thing earlier. Still, not wanting to be a pedantic poop-head and spoil the party, let me tell you that at first sight things look good. Punkish costuming, restrained, deliberate staging, and – a bit of an oddball – determinedly R.P. accents. After an initial tableau of prescient despair: Blast of Lights! The audience jump in their seats, and the obligatory countdown to our collective death commences: 10….. cue scene. 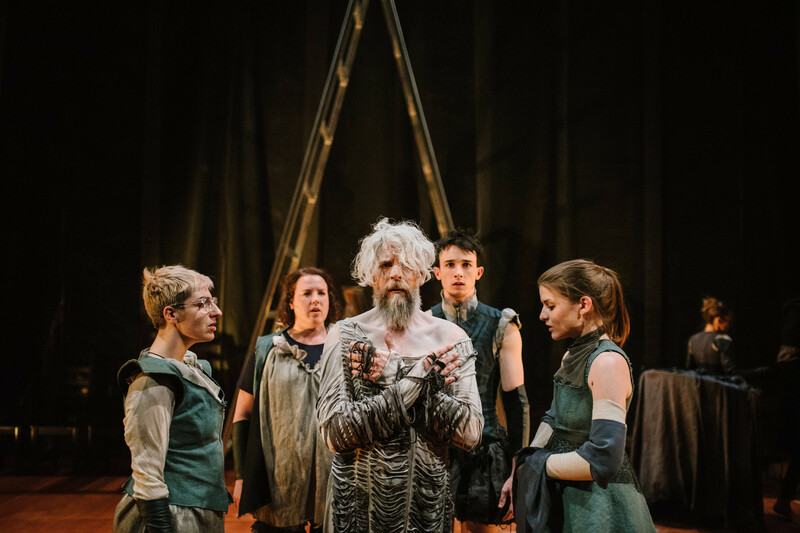 The actors move forward and greet us; they reveal their hopes for the show, for The End… Polly Sara playing Polonius thinks her character is all about family (tell that to Ophelia). Peta Ward is playing both Rosencrantz and Laertes, two male characters. She’s thrilled. Not really, but she’s game. Hamlet (Mitch Wood) says ‘I’m Mitch, and I’m Hamlet; and I really hope they like me’. Which is chuckle worthy. Again, this is not a rehearsal, this is ‘for real’: if not now, when? Blast of Lights! The audience jump in their seats, and the obligatory count down continues: 9……. cue scene. What begins clearly – some arresting visuals, some unlikely humour, a deliberate physical stylisation – pulls apart, palls, dissipates, becomes deadly. And it seems rehearsed, not felt. Blast of Lights! The audience jump in their seats: 8……. cue scene. ‘Real Life’ sieves through the (much edited) text of the original play, occasionally the one informs the other. More often both the Hamlet text and ‘Real Life’ cancel each other out. I’m trying to like it. To be moved. To make any kind of link I can. Laughing when something strikes me as funny – what can I say? I give good audience. By now people are spitting, spraying red wine; fountains of red – pink really – wine in the air. Water features run amok. It’s not as if they have to worry about the stains for tomorrow’s show. And it’s funny the first few times. I guess wine spray explains the amount of plastic hanging in the rig. Though it would do to wrap the bodies in should there be any survivors of a mind to perform the obsequies. Blast of Lights! The audience jump in their seats: 7……. cue scene. Apocalypses like this one always seem to come with a warning: a few weeks, a few days, a few hours. A limited, but exact timetable. And they always promise total annihilation. The catastrophic ‘event’ will happen and that will be it. The fact that we are in fact moving slo-mo – not to say Sco-Mo – towards annihilation; and that it is unlikely to involve anything so specific as a big bang, but will be a disaster no less definitive for life-on-earth; is playing out, I suppose, as a daytime soap rather than a one-off drama such as this. Ophelia (Nicole Harvey) has her moments as do Hamlet and Gertrude (Katrina Cornwall), so that you find yourself wondering what it might be like if they just acted the play, or maybe cut down the ‘real life’ framing so that it happened less frequently, or more abruptly, erratically, unexpectedly. Or if they stopped trying for effect and just told the darn ‘real life’ story. Nicole Harvey, refuses to be impressed by Mitch’s profession of love. So that’s sad. Thomas Hutchins (Claudius) is on a power trip. ‘Get it right!’, he demands when others fumble their lines. ‘Thank you Thomas’, they reply. He’s better as Thomas than as Claudius, which ought to be reassuring but somehow isn’t. Through the show, the cast say goodbye to each other. ‘To be or not to be’: it’s a bit redundant now, isn’t it?? ‘Keep going Mitch’, says Gertrude. Chris Becky as the Ghost of Hamlet’s father, throws ashes in the air. Is it supposed to be a comment about the pointlessness of existence? The banality of our imaginings? So far it’s seemed deeply superficial. But mostly you feel as though you’re at a speed run that’s not going very well. Reviews for previous incarnations (they started developing the piece in 2009 and have performed it many times) have verged on the adulatory. This is, apparently, theatre that will change your life. Or maybe make you wish the Apocalypse would just get a move on. Apocalypse Now, as it were. Maybe it’s had its day. Maybe we’re all apocalypsed out. I was with them ’til about 5 and a half.